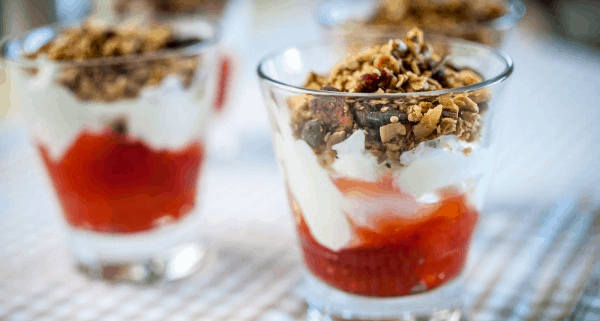 Our granola pots are a popular breakfast choice among our guests so we thought we would share our head chef Ben Bass’s special recipe so you can recreate them at home. They are a great start to the day, with the added bonus of being very simple to make. For the granola, mix all the dry ingredients together in a bowl. Warm the syrup, oil, vanilla (if using) and grated orange in a pan, whisking to break up the vanilla and zest. Mix this well into the dry ingredients. Cook on greaseproof paper on a baking sheet, in as thin a layer as possible for about 20 minutes at 180 degrees celsius, stirring a few times to ensure an even golden colour and no sticky, syrupy bits. Allow to cool and put in an airtight container. It will keep for a few weeks. In a nice glass, or a bowl for a bigger breakfast, layer the compote, then the yogurt and finally, add a generous handful of granola. The granola can be used for all sorts of things – eaten by itself as a snack or mixed with golden syrup and butter, a handful of oats and baked like a flapjack. This is not a healthy snack, but delicious nevertheless!